Several readers ask me which wine to choose for health. Although several studies show red wine benefits heart and other body parts there is no one grape, wine or region that can guarantee maximum benefits and my advice is to drink what you like the best, but avoid the really cheap wines which have hardly any anti oxidants. One reader has gone to the extent of asking which particular brand of wine he should drink. My answer is simple: go according to your budget and pick wines that you like-it does not matter if they are Indian or imported, red or white or pink, still or sparkling. It is slightly more helpful if you drink red wine although some recent studies indicate that white wine may be as effective. Several studies have shown that daily consumption of up to 2 glasses of red wine prove beneficial to the heart. Although the real reason is still not very well known, it is attributed to antioxidants present in the skins, pips and stalks of the grapes. Resveratrol is the all-important chemical that is considered beneficial for the heart and many wine drinkers like to know which wine they should drink where the content of this positive chemical is highest so they can drink for health. Unfortunately, it is also a fact that when the wine is made and the colour is extracted from the grape skins, the level of resveratrol extraction is never on the mind of the winemaker. In fact, only a small portion of the available amount is extracted through a technique called maceration. Dr. Andrews Waterhouse is the Professor of Enology at the University of California, Davis Campus. He is a wine chemist who specializes in phenolic compounds and their effect on the taste of wine and their health effects. I have met him on a couple of occasions at the international Heart and Health Conference in Napa. 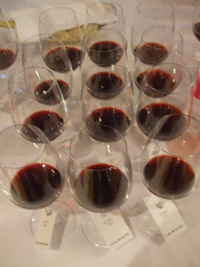 He says that a maximum of about a third of resveratrol is extracted from the grape- usually even less. Tannat grape variety (found mostly in southwest of France and Uruguay) has perhaps the highest resveratrol level; Cabernet Sauvignon is known to be so rich in the chemical that once Chile claimed that their wines were the healthiest because they use a lot of this grape in their wine. But in actual practice, it is extracted much less; otherwise it would be too tannic, dry on the palate and nearly undrinkable. Dr. Jim McCord is another wine chemist in San Francisco with whom I discussed the issue since he and his wife Lesley who have worked for Gallo for a decade, focus on the phenolics and flavours in wine. He laughs it off by saying that if you are looking for resveratrol, you need to drink 10 liters of wine a day-you are probably better off taking the resveratrol pills that are available in the market. Of course, these pills don’t give the pleasure that wine does and the medical opinion is still divided on their usefulness. The most honest opinion would be to drink two glasses of wine a day (ok…maybe three, though the increased alcohol could be harmful for other organs), preferably red (you might look at Shiraz, Cabernet Sauvignon or Nebbiolo, if you like the flavour). Don’t worry about the label and brand though I would recommend staying away from the cheap wines-not only are you missing out on good flavour and pleasure, but the cheaper ones have much less anti-oxidants due to a higher juice/skin ratio and generally have more chemicals like Sulphites infused to keep there flavours going off. Focus more on the quality, flavour and your palate and pocket… And of course, limit the quantity of daily intake.